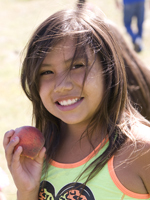 Nutritious food is often scarce and expensive on rural and geographically isolated reservations in the Southwest. This places a heavy burden on all residents, and especially on frail and impoverished Elders. Many Elders have no transportation, and live a long trek across rough roads from the nearest grocery store. They often lack electricity, so they cannot easily store perishable foods. Grandparents are often the primary caregivers for their grandchildren and many times will put the young ones’ needs before their own. The result is that when their monthly resources are exhausted, these Elders may be facing a bare cupboard. 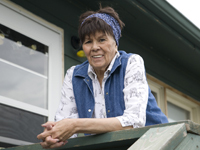 Among Native American reservation populations, Elders are among the hardest hit both by food insecurity and by nutrition-related diseases such as diabetes and heart-disease. During the latter weeks of the month, when social security and other forms of support have typically been exhausted, the SWRA Food service delivers food and water supplies to partner communities. Teams of local volunteers sort and package the food, then distribute or home-deliver it to Elders. For many homebound Elders, the SWRA food deliveries make the difference when worrying about where the next meal may come from. They look forward to and treasure these visits — not only for the food, but also for the companionship. Caring for Elders is a strong value in Native American culture, and food provided by SWRA and local volunteers helps communities honor this enriching opportunity. Although items may vary, SWRA also provides staples like canned fruit and vegetables, flour and coffee to food banks and Elderly Nutrition Centers. This helps these vital services stretch their limited budgets and provide quality, nutritious food for the growing number of those in need. 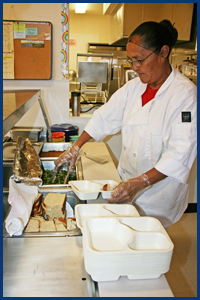 These centers provide not only nutritious meals, but needed social interaction. 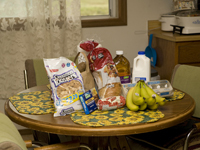 SWRA Food also provides supplies of nonperishable food for distribution by reservation food banks to families in need. 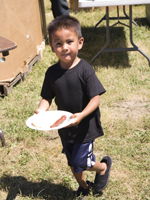 Additional food is provided through our Easter, Thanksgiving and Christmas services.